Camcorder has been part of many people lives. This video and pictures taking device has been around since before the era of smartphones. Until today many people still uses camcorder to record their videos and photos. Unlike many years ago, camcorder these days is featured with many additional functions, made to ease and support the users. Among those many camcorders available in the market, in this article we will try to compare two of famous camcorder, which is being used by many people and of course both of them have their own pros and cons. they are Panasonic HC-V770 and Sony HDR-CX405. – What is Panasonic HC-V770? – What is Sony HDR-CX405? Panasonic HC-V770 is a camcorder released by Panasonic to replace its infamous HC-V750K series. Panasonic HC-V770 able to records to SD, SDHC, and SDXC memory cards in Full HD video. This camcorder featured with High-density, ultra smooth video at 1080/60p. Panasonic HC-V770 also includes a fast F1.8-F3.6 lens that was created for it especially to help in low light situations. The wide-angle 29.5 mm lens this recorder has, making it able to take and fit more people and more of the background into the frame than other conventional lens. Panasonic HC-V770 is featured with the back illuminated sensor as large as ½,33” High Sensitivity Sensor, this can provide up to 1,920 x 1,080 of HD resolution and also improving the video in low light. This camcorder can take up to 24.0 megapixel still pictures. There are also advanced features included in this camcorder, such as the new Hybrid optical or digital image stabilization with HYBRID O.I.S. This feature uses five-axis correction to suppress blurring, 20x optical zoom and digital zoom up to 60x. It also came with accessory shoe, and external microphone jack. In full HD resolution HC-V770 can records to MPEG-4 H.264 at a higher 50 mbps bit rate. In addition of it being full automatic HC-V770 also can be set manually by changing the settings with the Multi Manual Dial. For best quality video, HC-V770 has and HDMI Mini Connector to plug in HDTV. An accessory shoe also allows you to add an external light or microphone. It also has Built-in Video Light and Flash, featured with a 3.0’’LCD 460,800 pixels. This camcorder has a new microphone, which is shielded from wind noise, so it will be great for outdoors shooting. The microphone also has a 5.1 inch Surround, Zoom, and Focus features. The sound in HC-V770 is recorded in Dolby Digital 2 channel or Dolby Digital 5.1. External microphone jack, Crystal Engine PRO+ processor, and Built-in Wi-Fi are also included in this camcorder. Sony HDR-CX405 is a camcorder released by Sony back in the 2015. This camcorder is said to be the newer version of HDR-CX330. However the most intriguing this about this camcorder is the price. Somehow even though it have a higher number than HDR-CX330 it has a lower price, but unfortunately HDR-CX405 also comes with lesser features, this might be the reason why it have a lower price. From its design Sony HDR-CX405 is look older than it should be. This is because HDR-CX405 does look exactly like HDR-CX330; they have the same weight and dimension. According Sony, the camcorder has a built-in USB cable, which can be used to transfer data or charging the camcorder. HDR-CX405 is featured with 2.7 inch display and using Clear Photo to improve the look of video preview. Beside the display placed a joystick and a preview button, this features making HDR-CX405 is very easy to use. Placed on the back a very common button exists, it is used to record video, while the top features the zoom lever and other common buttons. Sony HDR-CX405 supports MP4 and AVCHD codecs as well as Sony’s own XAVC S format, this feature will allow you to record in 50 Mbps 1080p video at 60p. This camcorder also have 26.8 side angle ZEISS lens, the video quality is more than decent and it can zoom up to 30x. HDR-CX405 also offers the Clear Image Zoom, which uses a special algorithms to allow zooming up to 60x. It also has 7 pictures effect to enhanced still photos and videos. Aside from that HDR-CX405 comes with face detection to improve the quality when taking videos involving people. Even though this camcorder featured with many things, but the lack of Wi-Fi will making it difficult to share videos and still pictures without having it transfer to PC first. 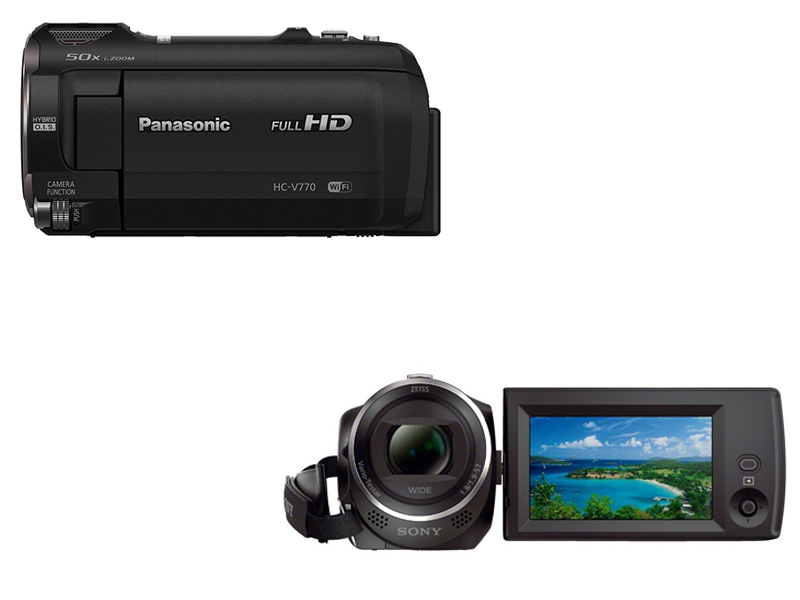 When choosing between Panasonic HC-V770 and Sony HDR-CX405, it is wise to compare them based on their feature. From what have been said above Panasonic HC-V770 is superior in various features, while HDR-CX405 is actually pretty decent, it lacks of special feature such as, the shielded internal microphone. This feature is very useful when doing outdoors recording. Aside from that HDR-405 doesn’t have Wi-Fi, so you can’t share your pictures or video without transferring it first into your PC. If you don’t mind spending more money, we think that Panasonic HC-V770 will worth it.